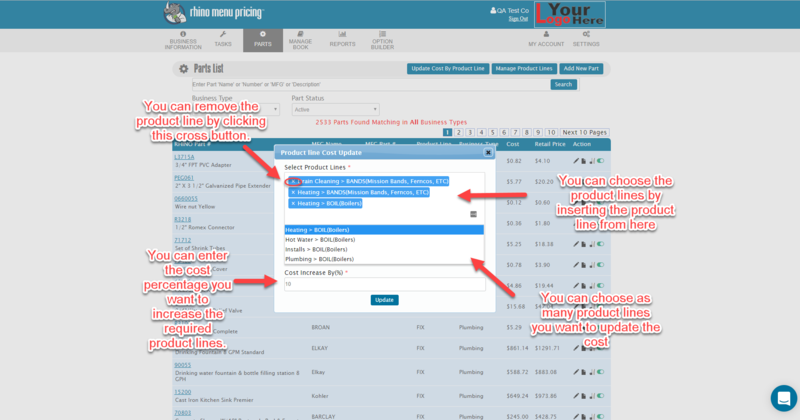 If, for any reason, you have a line or products that you'll need to change the price on and you don't want to do each part individually, then Profit Rhino has the perfect solution for you. We're going to go through how to update the price of an entire product line with just the click of a few buttons. First, select a business type that you'll be choosing your product lines from. Then, you'll need to select which product lines you're updating. (the following image will show you how to do that). Finally, choose the % they're being increased by. For instance, if all of your parts in the product line of have suffered a 2% price increase, you'll put a 2% price increase here to compensate. Click update once you've input all the information above.